Damn, I love the town I exist in! It is known by many names, the Cream City, the Jewel by the Lake, or by Alice Cooper and the Algonquin definition, Mil a Wa Kay. For those who have never visited, I say – what are you waiting for? It is one of those places that has become a very motocentric destination. The world becomes our guest once every five years when Harley- Davidson pulls out all the stops and celebrates its birthday in grand fashion. We have also become a winter destination for Flat Out Friday and the events that go on during that fine February weekend. There is always loads of other stuff going on too. We not only have a circle track here in town (The Milwaukee Mile) that runs a variety of motor races but there is also a world class road racing track (Road America) just up north a tick. Little by little the shows and events in the summer are becoming a reason to stay rather than hit the road. 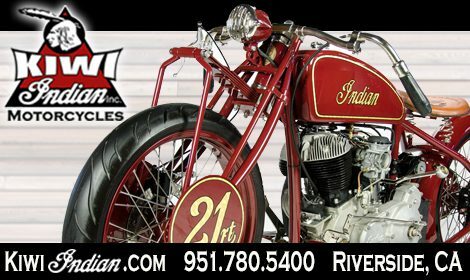 We start the year off with the Brew Town Rumble, hit the mid-summer stride with the Wild Ones weekend at the Harley- Davidson Museum and now we have the new kid in town hitting us with the heavy duty 1-2 combo, The High Voltage Show and Races. 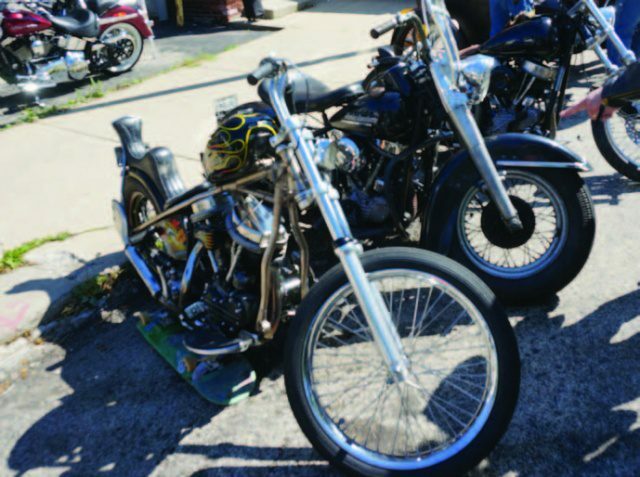 Back in 2016, on a typical Tuesday night at our local watering hole, Frank’s Power Plant, and an idea came to Ron Brefka and his partner in crime, Chris McMorrow, that they should host a show right on the street in front of the bar. Frank happened to be in town that night and green lighted the idea and thus the show was born. The first go around was a quick and dirty affair. There were only two months to prep and get the word out. And as luck would have it a wicked morning thunderstorm rolled through town on show morning, so there were only about thirty bikes in the show corral. 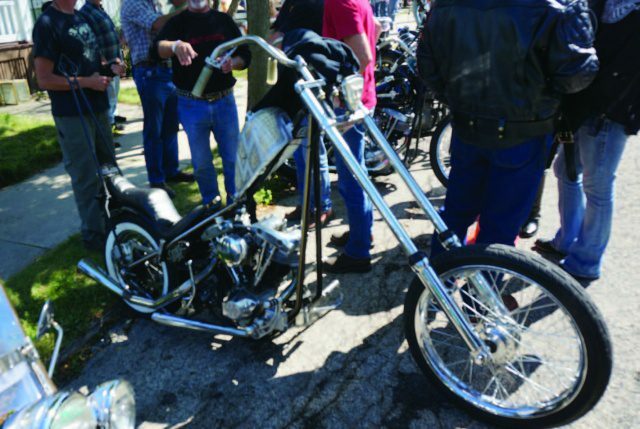 The second edition happened last September and with a year to get the word out, a perfect sunny day on tap the street filled up and the bikes spilled out onto the main street as well as all the side streets. 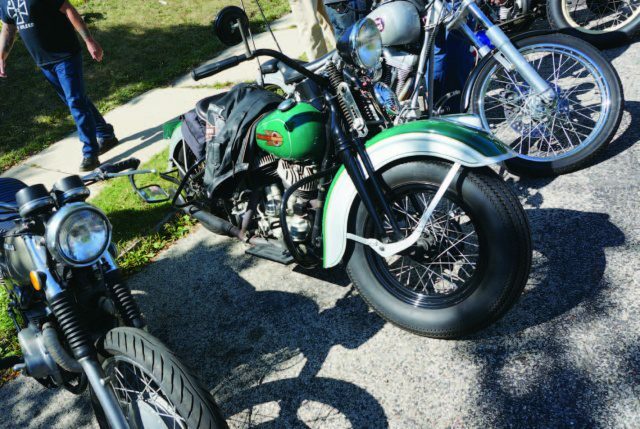 All in all, over 100 bikes were on the display row. Judges gave out pennant flags to the winners. 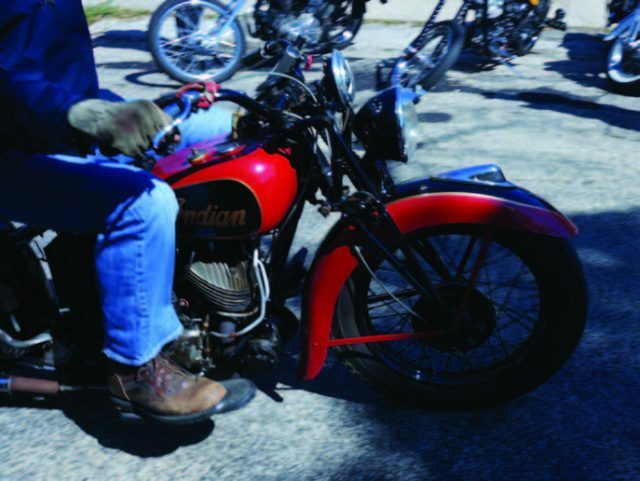 It was a day of motorcycles and music from a number of live bands on the big outdoor stage, and people. It still amazes me that in a city as large as Milwaukee our little family grows a bit bigger every year but still remains as tight and dynamic as it has always been. The day wore on, the beer flowed, and BBQ was sold from a sidecar rig which made for lots of smiles. There was also a bit of money raised that was donated for the conquering of pancreatic cancer research. A lot of people donated some great prizes for the raffle. As day turned to night, High Voltage came to a close for another year. I can only imagine how much better this next year will be. 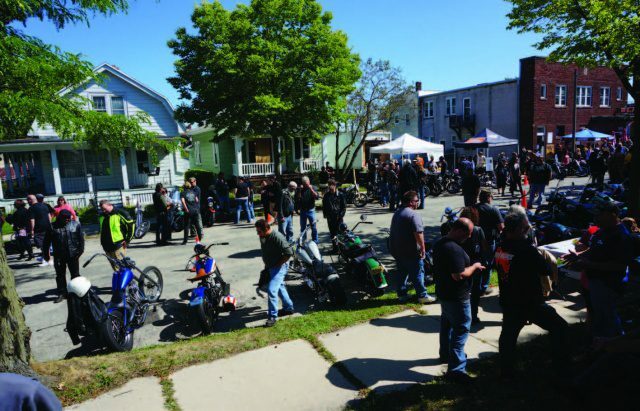 Milwaukee sure seems to love its street festivities and the ones involving motorcycles are, of course, the ones I like best. For those who are interested in joining the festivities in 2018 it looks like the show is going to be the 2nd weekend of September. You can stay up to date on all the goings on by checking out the High Voltage Facebook and Instagram pages. Come join in the fun! After the success of the late summer High Voltage Show, Ronster and Chris turned their attention to another longstanding Milwaukee treasure that had not seen the light of day since the 80s; ice racing. The ice races that used to be held in Wilson Park, right here in the middle of the city on a frozen oval, on the lagoon in the heart of the park had not been seen for years. They were slated to happen last year, but the warm temps meant no ice so of course no races. As Ronster said to me, ya can’t lose faith and he was right! The weather cooperated this year and the ice was good. Ron reached out to local racing gurus Al Sumner and Mike Lange who were instrumental in the glory days of Wilson Park ice racing for the how-to do’s and whatnots. 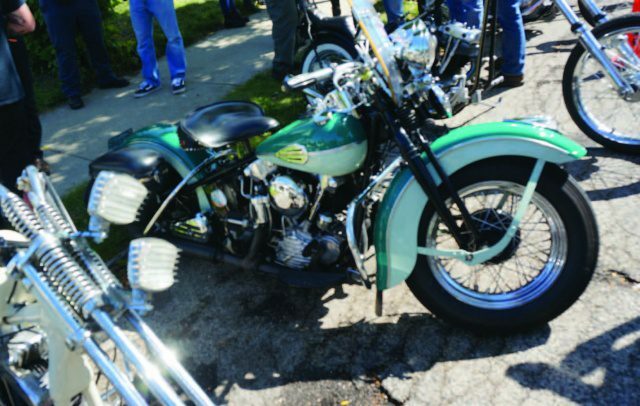 The deal was struck with the parks department and the rebirth of a classic was ready to roll. The anticipation was high in the city, everyone was talking about checking out the races. The field was set, the ice was firm, the mood was happy, and the sun came out to edge back the cold temps. The smell of high octane exhaust was in the air and then the first flag dropped, and the game was on! Race day was finally here! 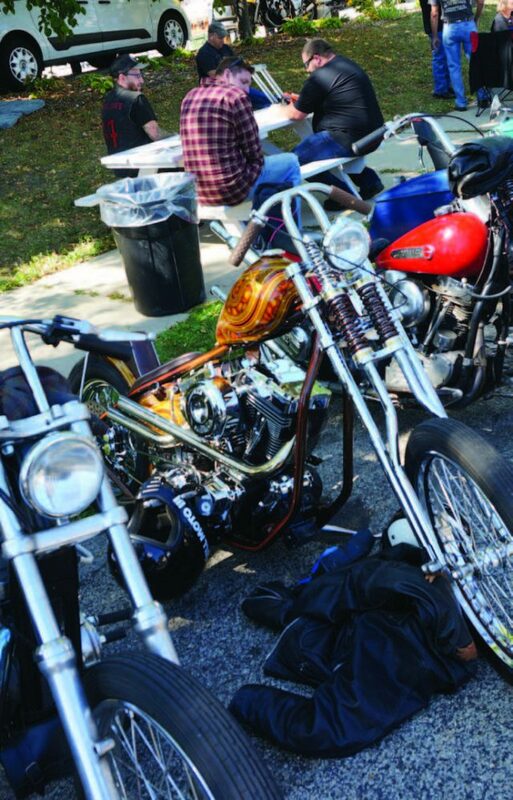 The pits were full of bikes and Chris Tice was chatting the crowd up, it was an electric day. 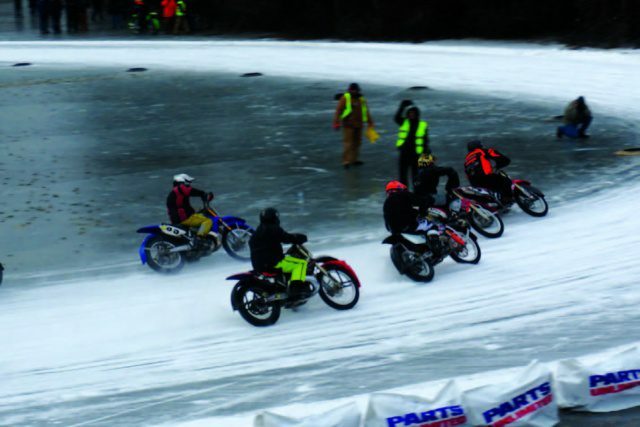 If you have not ever seen bikes race on ice it is something extra special. It has all the skills that dirt track requires but with the added fact that ice is slick. 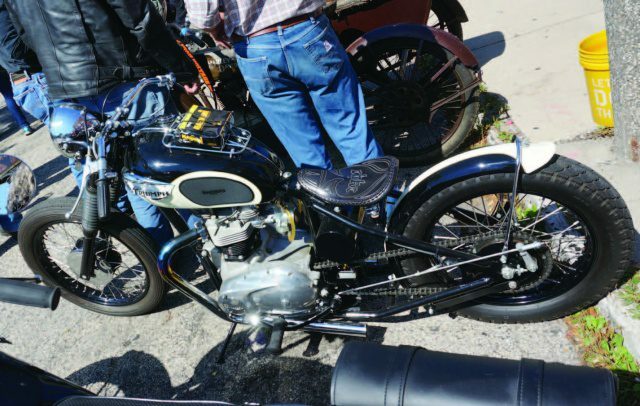 The bikes are fitted with either studs or spikes depending on where in the world you are. Short studs are the name of the game in the Midwest. The really exciting part of flying on the ice is the fact that you can get just that little bit lower and faster because of those very studs on the tires. But if you go just that step too far… BOOM, on the ice and out you go. That’s the fine line of racing on the glowing edge of a knife. If these stories ring a bell in you and you care to check out either of the shows this year, stay tuned in by checking out the High Voltage Facebook page or you can follow @high_voltage_ show on Instagram. There are also two other pages that everyone should check out. 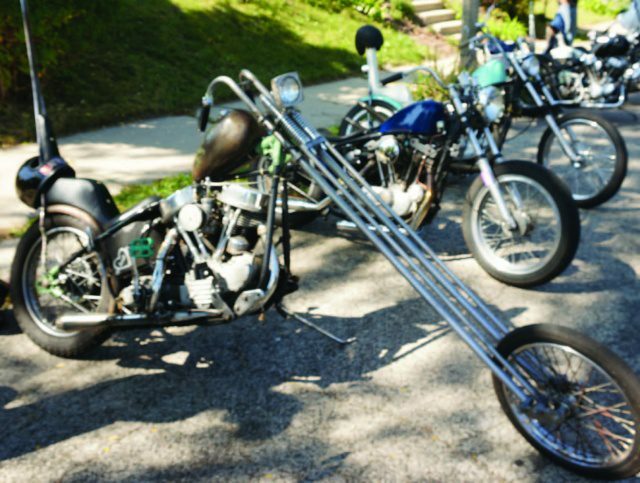 Ronster in no stranger to the world of custom fabrication and has been supplying the world with some high-quality parts through his company 7 Metal West check him out on Instagram at @7metalwest. Chris has also been very involved in the world of motorcycles through his own beautiful machines and his excellent photography skills. He also is chief cook and bottle washer over at Black Horizons and can be found at the same name on both Facebook and Instagram. Of course, none of this happens without the help of lots of people: there are way too many to name but both Ronster and Chris mentioned the tireless help of Chris’s girl Rita. She gives her time and effort tirelessly to help keep everything afloat. As I said before, come be our guest for one or many of the events in Milwaukee and look me up, I will happily show you the sights! 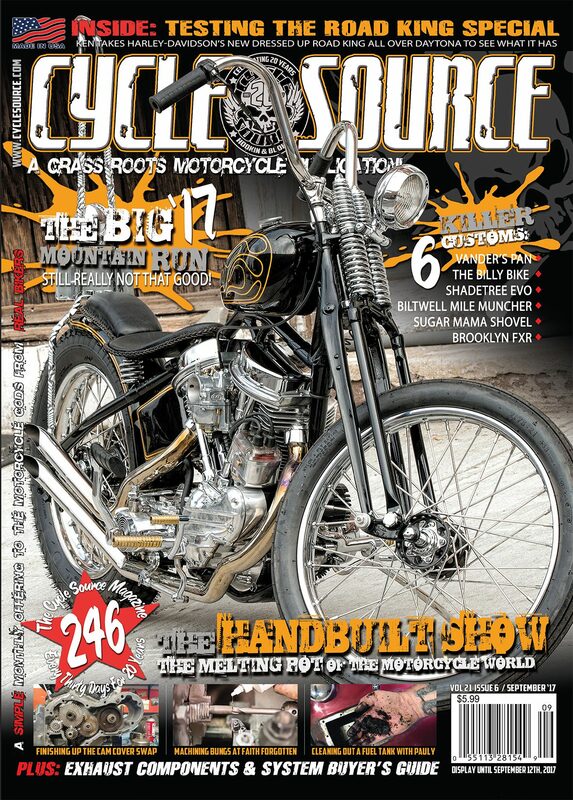 This entry was posted in Event Reports, Races and tagged Back Issue, Cycle Source, Cycle Source Magazine, Events, High Voltage Events, May 2018, Milwaukee, Milwaukee Mike. Bookmark the permalink.